We know that runway fashion is not for everyone. After all, who would wear Alexander McQueen's Armadillo shoes on the street other than Lady GaGa? So we looked at all of the high fashion reports for you, so that you can get a rundown on the biggest trends we will be seeing on the streets this summer, and how to keep them cool and breezy with the perfect socks to match, our indisputable area of expertise. Shapes: You're lucky, waves and ruffles are still in! So if you didn't get your blouse last year, you will still be able to find them at your favorite stores. These shapes have become staples of the Spring/Summer season, representing coolness﻿ and freshness.﻿A new hit this season, is the relaxed out-door robes. Yes, you read that right, robes! Silky-smooth comfort everyday and everywhere. And don't forget about the big shoulders. They are no new-comers to the high fashion runway, but are slowly making way into people's everyday closets. 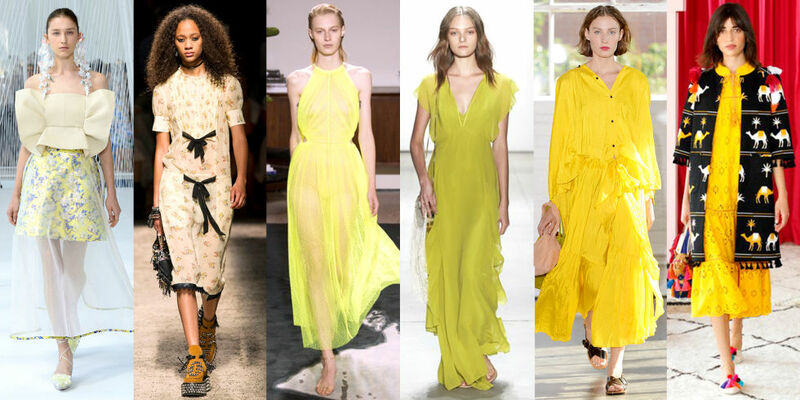 Colors and Prints: This season is all about YELLOW. We've seen it in this year's Red Carpets, and now this bright color is making it's way into our closets. This color resemble's the brightness of the summer sun and will bring cheer to any outfit. Also, the classic spring flower prints are going retro with a 70's vibe: cover yourself in flowers and spread the love! Another big one this year is STRIPES! They reminiscent beach houses and sailing style, so steal your dad's stripy summer shirt and rock the streets. Styles: In a year of big social turmoil, there is a place for PUNK in all areas of culture, including high fashion. No, you don't have to go get a mohawk right away, but don't underestimate the empowerment of studs and all-black-everything outfits. However, traditional cowboys get a shout out too, with the classic leather fringes. So, now that you know the main trends for this season, you have to make sure your whole outfit is perfect for the high heat temperatures of the summer. Match your WICKed style with our InvisiCool moisture WICKing no-show socks to look cool and also feel cool.